Brent Minor, executive director of Team DC—an organization that promotes LGBT sports participation in the Washington area—remembers feeling pessimistic about the first-ever Washington Nationals Night Out. It was 2005, and his organization “totally emptied [its] treasury” to buy 200 tickets for LGBT fans. “We thought, ‘Okay, we’re going to lose our shirts,’” Minor says. Minor kept his shirt, and maybe got a few more. The group went to the annual Capital Pride festival in D.C. and sold out their tickets within an hour, eventually bringing about 1,000 people to that game. Since then, that number has grown to between 3,500 and 4,000 annually. If anyone still holds outdated ideas about sports and the gay community and an inherent divide between them, the success of this event is an obvious counter. In the second year, though, Minor got a reminder of how far there was still to go. He hoped to connect the event more officially with the Nationals—who were then still owned by Major League Baseball—through either participation in the ceremonial first pitch or the national anthem. He met with two men from MLB’s New York office, and after some consulting, Minor suggested that the Gay Men’s Chorus of Washington sing the national anthem at the next Night Out. That was over 10 years ago, back when an LGBT Pride Night at a ballpark was a strange novelty for many longtime baseball people—not out of malice, necessarily, but at least a simple lack of understanding. 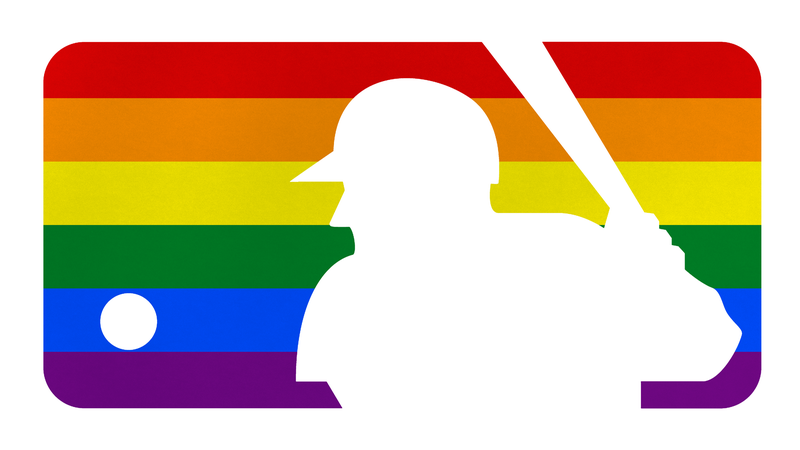 Since then, while baseball still has yet to see an active major-league player publicly come out, there’s been an increased connection between the sport and its queer supporters. Since starting with fan-organized “Gay Days” at Wrigley Field in 2001, Pride Nights have spread to almost every other major league ballpark, with only four teams still yet to hold one. They serve as opportunities to educate straight baseball fans and dispel stereotypes, while also inviting queer people into spaces that may have once been hostile or intimidating. “We always get a wonderful reception from the fans who are down near us. They cheer for us as we come onto the field, they cheer after we sing, and they cheer as we leave. That is something that makes all of us feel welcome and accepted,” says Chipper Dean, president emeritus of the Gay Men’s Chorus of Washington D.C. and singer of the anthem at the last five Nats Nights Out. Billy Bean, a former player who came out as gay in 1999 and became MLB’s ambassador for inclusion in 2014, credited a policy issued in 2013 protecting players from discrimination and harassment based on sexual orientation as the start of a newfound dialogue about baseball and LGBT issues. His role with the league has also allowed him to approach the subject in a unique way—as someone who knows both baseball culture and the gay community. “For the very first time, the players were hearing that conversation started from a former player,” Bean says. Most of the credit for the dramatic increase in these Pride Nights, however, goes to the community organizations like Team DC, who typically create and pitch plans for the event, which clubs can then endorse. Bean mentions both the Long Island-New York LGBT Network (for the Mets) and the Greater Seattle Business Association (for the Mariners) as organizations that proposed comprehensive, agreeable ideas that helped kickstart Pride Nights at their respective ballparks. “They brought some really positive energy to those clubs, and those clubs turned right around and produced a night that was really impactful,” says Bean. Many cities and ball clubs are now openly expressing support for LGBT inclusion by having their own Pride Nights. The St. Louis Cardinals, for example, will hold their first-ever Pride Night on Friday, Aug. 25, and although the group Pride St. Louis has held unofficial events at Cardinals games in past years, a pro team has a marketing power and reach that’s practically unrivaled. While Pride St. Louis told me that they typically brought 100-200 fans on their own Pride Nights, the Cardinals said that they have sold nearly 2,400 tickets through the promotion for Friday’s game. This is a meaningful step for the Cardinals, who recently hosted a Christian Day at the ballpark featuring former player Lance Berkman as a speaker. Recently, Berkman appeared in a political ad opposing Houston’s Proposition 1, an ordinance that would have protected residents from discrimination at work, among other places. Berkman spoke out on the issue because he was concerned about “troubled men who claim to be women” entering women’s bathrooms. Professional sports are still, to many queer people, a space of homophobia and exclusion, but the understanding and common ground brought by these nights can help eliminate ignorance and introduce new fans to baseball. It’s a benefit to all, especially MLB, which has an obvious interest in growing its fan base and expanding its sport to those who may have once been shut out of or intimidated by the ballpark. “There’s no one in baseball that wants to create a negative experience for a fan,” Bean says. Pride nights aren’t unique to baseball, but they seem to be especially suited to the sport. Unlike basketball or hockey, baseball is played outdoors, at a leisurely pace with no clock in a park with plenty of space. And unlike football, the high number of games each year can make a regular season contest more of a casual night out than an evening of high-stakes, competitive drama. These features make baseball more welcoming to those who may not always feel comfortable around athletic spaces. “It’s ironic, because there are a lot of detractors that think our sport is too slow, but I do think it offers the most enjoyable in-game experience when it comes to people in a community,” Bean said. As much as Pride Nights have done to make LGBT fans feel welcome at the ballpark and connected to their team, Minor sees opportunities to further strengthen those bonds. For starters, he’d like to see teams get even more involved, and make athletes available at LGBT-related events. He brought up Capitals goaltender Braden Holtby’s participation in DC’s pride parade, noting how much it can mean for a young, queer sports fan to see that they have the support of one of their heroes. “If Major League Baseball accepts you, then your parents are going to be no problem,” Minor says. “It’s so powerful if we can get the players to be a part of this conversation and find something that they are passionate about, because they have such influence over our young fans,” Bean says. “We have players who are young and at the peak of their lives and their talent, and the kids just soak up anything and everything they say, and that’s a wonderful opportunity. Minor is hopeful that teams will continue to get more involved. But Minor hasn’t sensed any of that backlash. “I call it a ‘shrug of the shoulder pads,’” he says. Aside from creating a celebratory experience, a closer relationship with LGBT groups also gave teams an opportunity to provide a place of healing and mourning for queer fans. The Rays held a Pride Night on the Friday after the Pulse nightclub shooting, in which 49 people were gunned down at a gay club in Orlando. It was their most highly-attended game in a decade. The Nationals’ Pride Night, which was held two days after the shooting, went on after a conversation between the team and Minor. “Making sure that we had the opportunity to sing, to acknowledge the fact that that happened, I think that reflected how much more inclusive Major League Baseball has become,” Dean says. This change in baseball reflects larger changes in society. Dean notes that, particularly since the Supreme Court ruling in favor of marriage equality, his emotions surrounding the anthem have evolved. “We talk a lot with each other about the significance of singing the national anthem, particularly as a gay group,” Dean says. “Any time that there is an opportunity for us to … almost sing the national anthem in protest, saying, ‘It’s our nation too,’ any time we have that opportunity it becomes that much more meaningful for us. “It’s always an honor and a privilege to sing the national anthem, but over the last couple of years, it’s taken on more and more meaning I think, certainly for me and certainly for a lot of other members of our chorus. We feel like we sing it less and less in protest and more and more to acknowledge that the nation is making progress in a positive direction. Minor relays a story from several years ago, from the first Night Out at the new Nationals Park. As he was leaving the field after the Gay Men’s Chorus sang, he saw a kid making his way towards him.